What’s better than one interim title? Ultimate Fighting Championship (UFC) brings out the first pay-per-view (PPV) of the ESPN+ era tomorrow night (Sat., April 13th, 2019) when the world leader in mixed martial arts (MMA) heads to State Farm Arena in Atlanta, Georgia. With Lightweight champion Khabib Nurmagomedov in self-imposed exile for the foreseeable future, Featherweight king Max Holloway will look to avenge his 2012 loss to Dustin Poirier in the main event with the interim 155-pound belt on the line, while Kelvin Gastelum takes on Israel Adesanya for the interim Middleweight strap as Robert Whittaker heals from his myriad injuries. Our usual predictions guru is stuck in an alternate world until he can defeat the Demon King, so main card coverage once again falls to me. You can check out the stuff I wrote about the UFC 236 “Prelims” here and here, plus a breakdown of the odds and betting lines here. It’s surreal to think of what the MMA landscape was like when these two first fought; I was in college at the time, at a Buffalo Wild Wings with my jiu-jitsu buddies to watch UFC 143: “Diaz vs. Condit,” and made it there in time to catch some of the Prelims. On one side was Holloway, a gangly 4-0 20-year-old who’d reached the lower end of the Bloody Elbow Scouting Report Top 10. On the other was Poirier, best known at the time for obliterating Josh Grispi when the latter had been booked to challenge Jose Aldo for the Featherweight title. Holloway showed some of the striking prowess that had caught BE’s eye, but tapped to a mounted triangle once “The Diamond” elected to take it to the mat. I ultimately won $20 that night from a guy who was certain Diaz would get the decision, but that’s another story. Now look at them, one a world champ and one who probably would be were it not for the once-in-a-generation monsters lurking at the top of the Lightweight division. 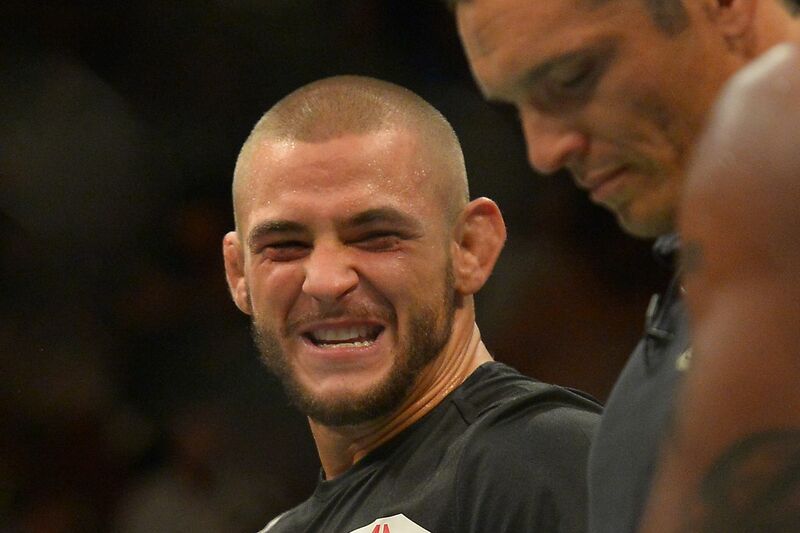 Holloway has won 13 straight, Poirier eight of his last 10, both men racking up post-fight bonuses like nothing. So how do they match up seven years and 10 pounds later? For one thing, Holloway’s ground game is no longer a liability. He’s given up just two takedowns since 2014, both to Brian Ortega, and immediately got back to his feet both times. Even with Poirier unhampered by a weight cut, I don’t imagine takedowns being a viable weapon for “The Diamond” outside of setting up his strikes. And as good as he’s gotten on the feet, he’ll need all the help he can get. Let’s not forget that even with his exceptional improvement, Poirier can still get sucked into a brawl; Jim Miller, Eddie Alvarez, and Justin Gaethje all got Poirier to slug it out. Holloway, meanwhile, only brawls on his own terms; Aldo and Ortega both failed to get him to lose his composure, and his incredible adaptability lets him rack up the punishment once opponents get reckless. It’s also worth noting that Poirier has taken an exceptional amount of damage in his recent fights and tends to wear it. I simply do not believe Poirier’s physical edge can compensate for the struggles he’ll face against someone he can’t reliably KO, take down, or outlast. It starts competitive, but once Holloway gets dialed in, he punishes an increasingly desperate Poirier until the damage piles too high up. Silly though interim titles may generally be, I’m cool with it if it means we get to see these two duke it out for 25 minutes. As incredible as Adesanya’s looked, it’s worth considering that his strongest opposition consisted of Brad Tavares, Derek Brunson, and an aged Anderson Silva. He hasn’t had to deal with the Weidmans, the Romeros, the all-rounders who can finish on both the feet and the mat. Gastelum, as it turns out, fits the bill. The thing people might understandably forget is that Gastelum can wrestle. Sure, he hasn’t hit a takedown since 2015, but when you’re dealing with the likes of Tim Kennedy, Chris Weidman, and Jacare Souza, initiating the grappling ain’t exactly a priority. Plus, he was too busy beating Michael Bisping’s and Vitor Belfort’s faces in to bother trying to wrestle them. He’s the most versatile opponent Adesanya’s faced by far, and his pressure will make it difficult for Adesanya to set his feet and potshot at range the way he likes. As much as Gastelum will get picked off, he’s shown that he can weather some terrible rounds before roaring back late. Unless Adesanya can dispose of him within two or three rounds, it’s going to get ugly for him. When Adesanya starts connecting and stuffing takedowns, people tend to stop trying to press the issue. What we haven’t seen is what happens when people don’t stop; keep in mind, it wasn’t all that long ago that Adesanya was surrendering heaps of takedowns to Rob Wilkinson and Marvin Vettori. Gastelum’s proven ability to fight through adversity and maintain pressure is something I’m not convinced Adesanya can deal with. Adesanya has a habit of rising to the occasion and him planting his shin on Gastelum’s face wouldn’t be surprising at all. If he can’t, though, Gastelum’s going to put him through the sort of wringer he’s never faced as a pro. Gastelum’s insane pace and persistence pay off as he grounds, batters, and ultimately submits Adesanya after a rough start. I’d like to know Anders’ reasoning for going back to 205 pounds; he was completely overpowered by Thiago Santos in his debut at the weight, and as garbage as his performance against Elias Theodorou was, that had nothing to do with being undersized. It’s especially confusing because his strength and athleticism are integral to his game; he’s not polished enough to get by on technique alone. That lack of polish could do him in on Saturday. Rountree may have some profoundly terrible fight IQ, but he’s one of the heaviest punchers in the entire UFC. Anders will most likely need to lean on his wrestling without the backup of being the much stronger man, which he failed to execute against Santos. That leaves trading left-hand bombs with a scarier knockout artist. This sounds more dire for Anders than it really is; he’s tough as nails, as he showed against Santos, and Rountree has a long and proud history of shooting himself in the foot. I just don’t see Anders, a straightforward slugger, surviving prolonged engagements with Rountree’s downright heinous knockout power. Admittedly, I thought the same thing when Rountree was booked against Johnny Walker, but I’ve never been wrong two times in a row in exactly the same way. Besides all those times I was. I didn’t realize how much I missed Alan Jouban until I heard he was coming back after 14 months away. As overused as the phrase “never in a boring fight” is, that legitimately applies here; only his fight with Warlley Alves, in which Alves gassed out in the first five minutes, the man is crazy entertaining. Grant has a similar capacity for extreme violence, but is much, much less apt to do so. He’s got a good 2-3, good takedown defense, and pretty much nothing else. He doesn’t jab, doesn’t really push the pace, doesn’t do anything besides throw those same two punches in various combinations. Here’s a fun stat for you: Grant landed 25 total strikes in 15 minutes against Dwight Grant. That’s one every 36 seconds. By contrast, Jouban landed almost twice that many in the first round of his fight with Ben Saunders. It’s “kill or be killed” vs. “kill or just kinda stand there for a while.” Grant simply does not win this fight without the knockout, and though Jouban is chinny enough to make things interesting, we saw against Mike Perry that Jouban can defuse predictable power-punchers. “Brahma’s” larger arsenal, greater volume, and superior technical skill let him run circles around Grant all night. Looks like the UFC is using long-brewing rematches as bookends for this main card. Krylov met St. Preux back in 2014 in the former’s Light Heavyweight debut, falling victim to a Von Flue choke in just 89 seconds. “The Miner” went on to win five straight before a loss to Misha Cirkunov booted him from the UFC, at which point he racked up four dominant wins on the Euro circuit before returning to the Octagon with a submission loss to Jan Blachowicz. “OSP”, meanwhile, has gone 8-7 since that bout, consistently falling short against top competition. As flaky as St. Preux is, it’s hard to pick against him when Krylov has yet to fix the defensive wrestling and submission defense that have led to him tapping out five times. St. Preux has a blatantly obvious path to victory and the tools to walk it, provided Krylov doesn’t crack him with something nasty before he can execute. Considering the sort of heavy leather it’s taken to fell St. Preux in the past, I’d say Krylov has his work cut out for him. Plenty has changed since 2014, but by the looks of Krylov’s last fight, not enough. St. Preux exploits that leaky ground game for another quick submission finish.